The Flintstones unusual neighbors are out for a drive in their prehistoric hearse. This wonderful artwork recreates the classic characters from ‘The Flintstone’ episode number 123 which aired on November 12, 1964. 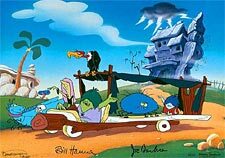 Weirdly and Creepella Gruesome, along with their son Gobby, move into Tombstone Manor, next door to the Flintstones. Trying to be neighborly, Fred and Barney agree to babysit Gobby, whose strange pets make for a tortuously eventful evening. This hand-painted limited edition cel is signed by small screen legends and creators Bill Hanna and Joe Barbera.